At first I thought he was joking, but then I could tell he was serious. He looked at me as though I were joking. 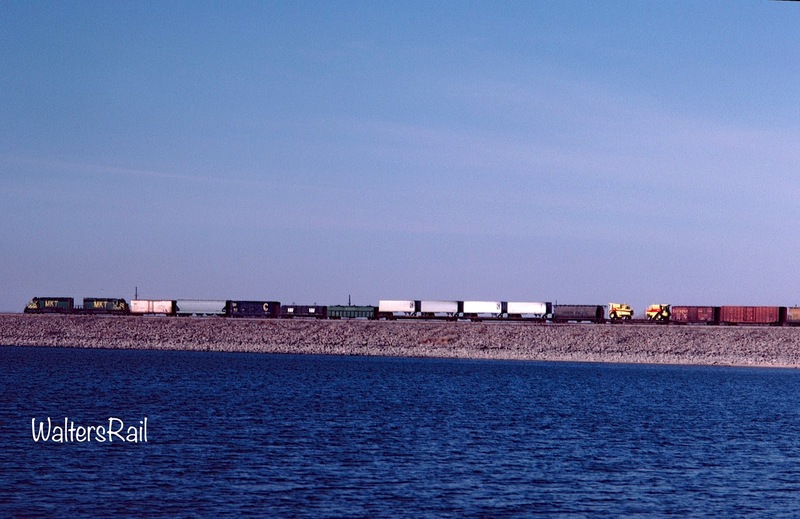 A southbound loaded coal train navigates past an arm of Lake Eufaula in July 1985. The lead unit was leased from Morris-Knudsen, while the three UP engines have come all the way from the mines in Wyoming. 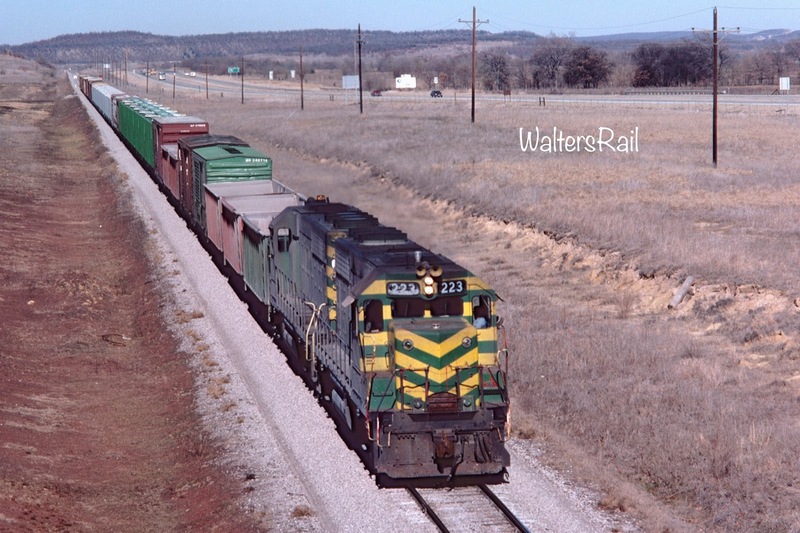 The lone Katy unit is painted in "John Deere" green and yellow, sometimes called "Whitman" green and yellow after the railroad's president from 1970 until acquisition by Union Pacific in 1988. 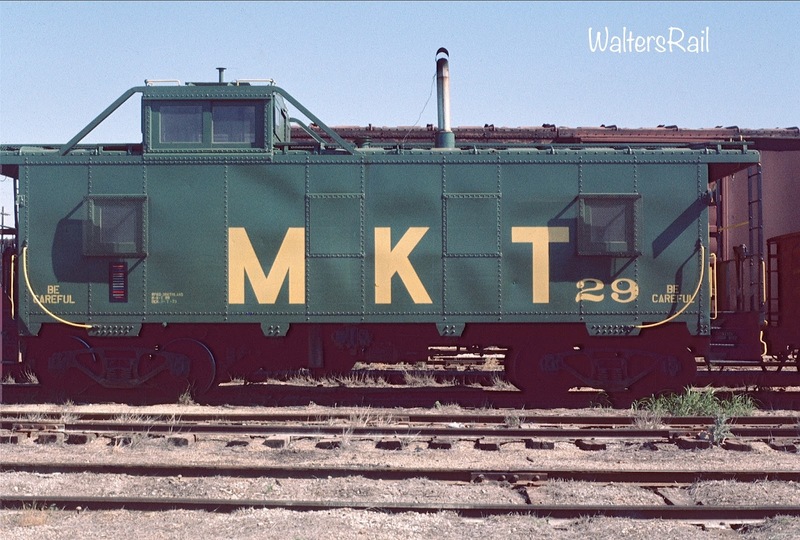 In that year, the forerunner of the Missouri-Kansas-Texas Railroad – the MKT or Katy – was born in Emporia Kansas, in the law offices of Preston Plumb and Judge Robert M. Ruggles. 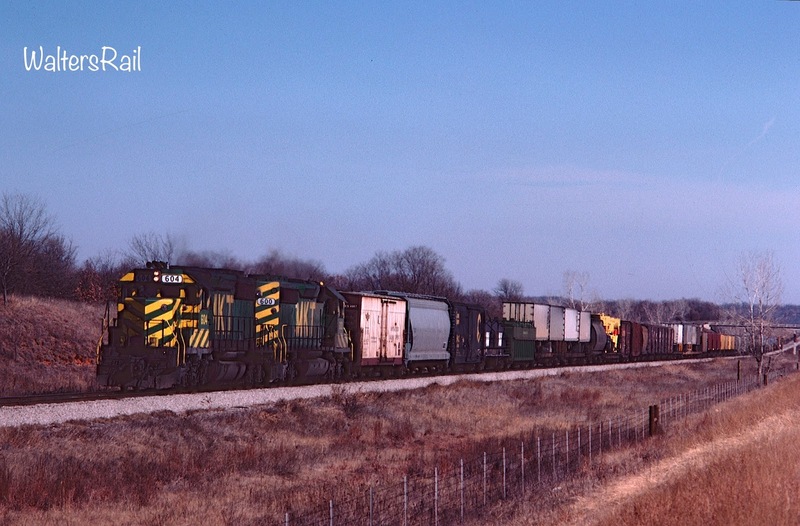 The Congressional land grant offered railroad companies 10 square miles for every mile of track constructed in the Indian Nations south of Kansas. After acquiring the rights of the Union Pacific – Southern Branch, the company by 1869 had constructed track from the UP connection at Junction City, Kansas, to Emporia. That year New York investors Colonel Robert Smith Stevens and Judge Levi Parsons bought (some sources say “stole”) these local Kansans’ interests. In 1870, these new investors created the Missouri-Kansas-Texas Railway Company and assumed the charter of the Union Pacific – Southern Branch. 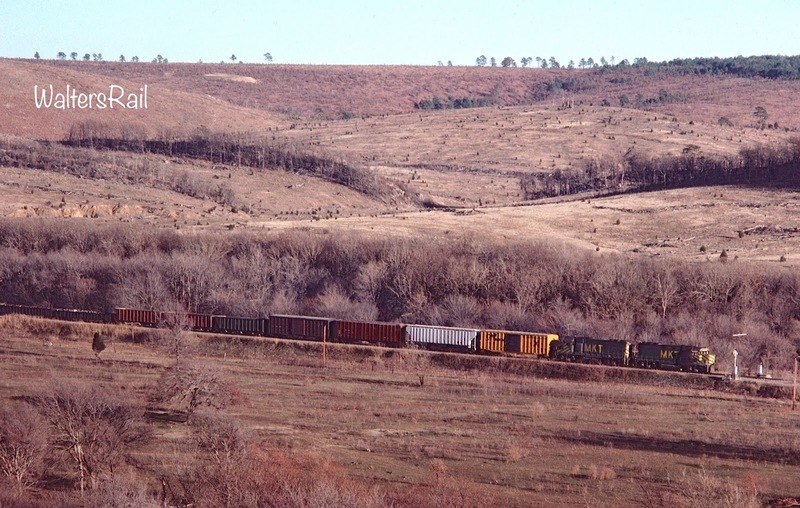 Thereafter, the MKT raced with the Leavenworth, Lawrence & Ft. Gibson and the Kansas and Neosho Valley railroads to be the first company to build a line south across the Kansas border into the Cherokee Nation and win the right to continue construction to the Red River and then into Texas, obtaining more land grants as it built south. 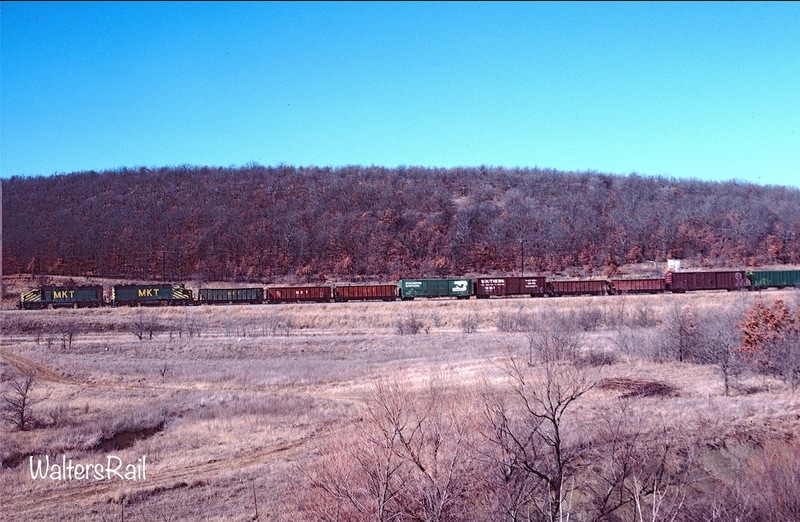 A southbound manifest approaches McAlester, Oklahoma, in January, 1982. Today (2017) this area is overgrown with second growth timber, making this shot impossible. South of Emporia, the MKT built through Burlington, Neosho Falls and Chanute, eventually reaching Parsons, named after the Judge. 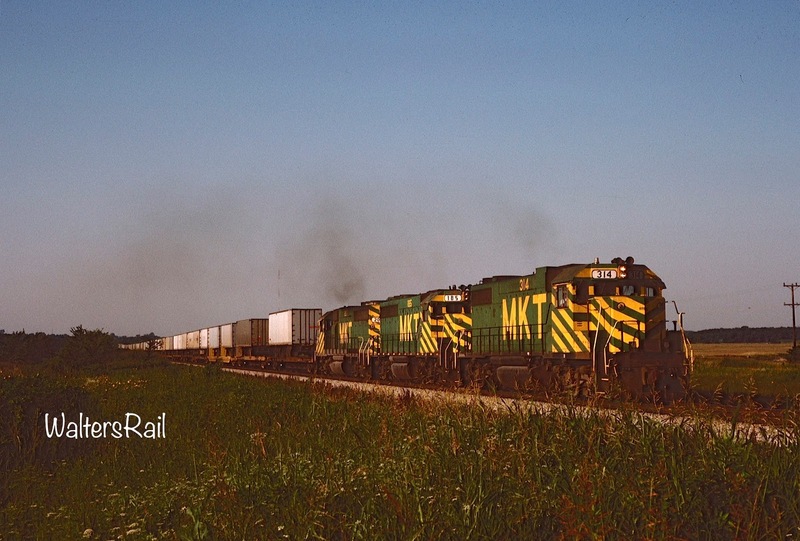 Before reaching the southern border of Kansas, the MKT sent a separate crew to construct a small section of isolated track across the state line – in theory to secure the right to continue building south. By Executive Order, President Grant stopped this project. He decreed that only contiguous construction across the state line would win the race. Shortly thereafter, the Leavenworth, Lawrence and Fort Gibson went broke and quite the competition. 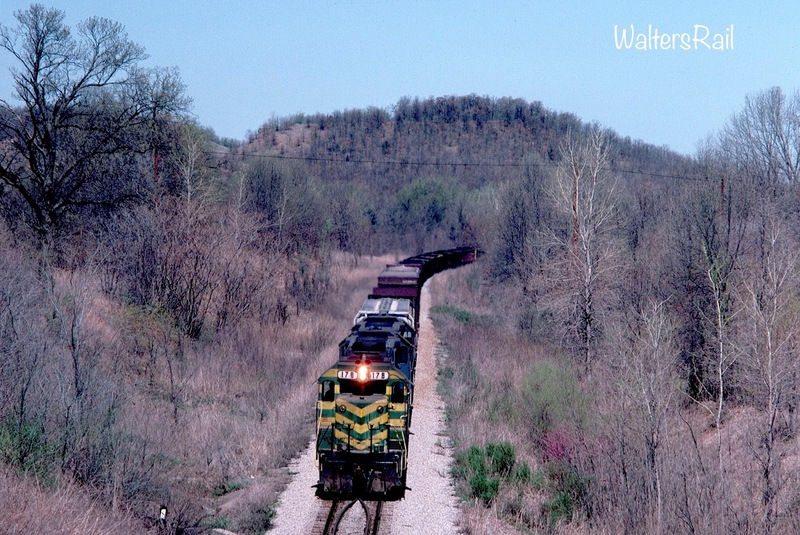 Due to surveying errors, the Kansas and Neosho Valley began building track onto land allotted to the Quapaw Tribe, but the K&NV reached the south border of Kansas at Baxter Springs before the MKT had closed its “gap” between the two segments. 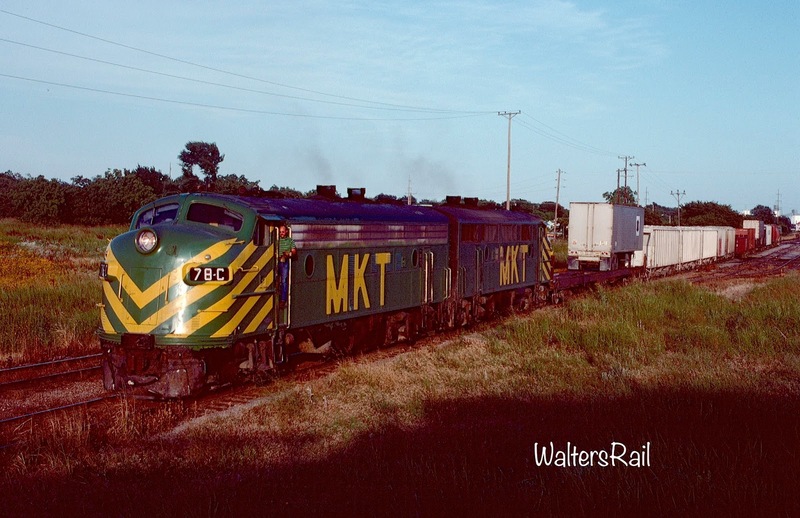 MKT 206 South rolls through Wagoner, Oklahoma in June 1972. 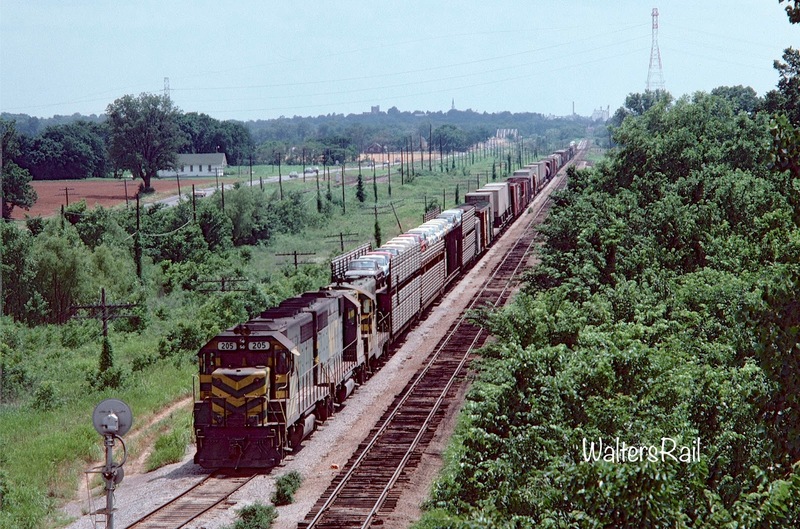 Wagoner is where the Katy mainline from Kansas City to Fort Worth crossed the Missouri Pacific mainline from Kansas City to Little Rock. 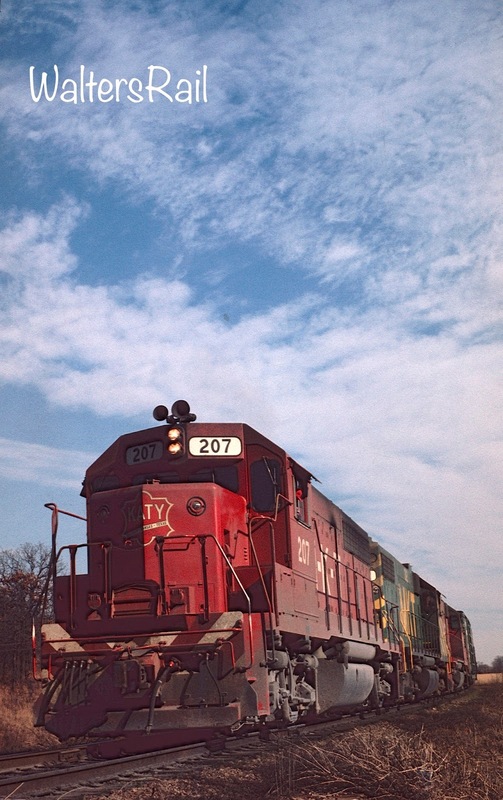 Number 206 wears "Barriger Red" -- named for the road's president from 1965 to 1970. The contest then shifted from the construction gangs to the courtroom. 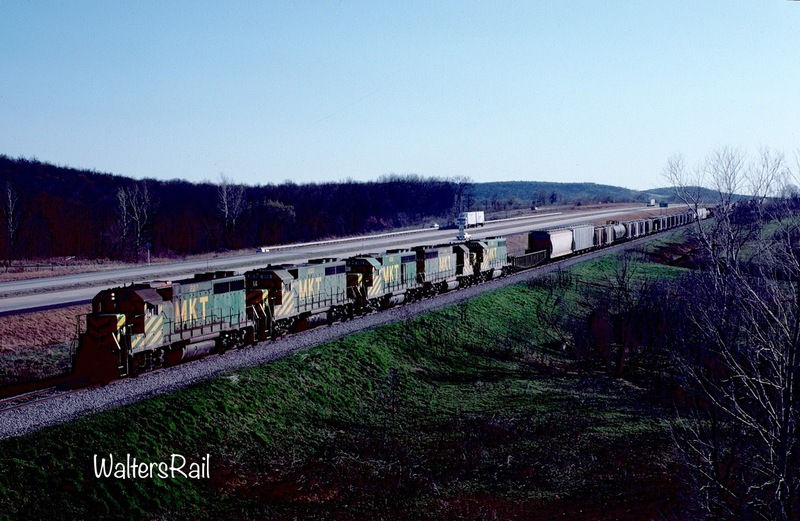 The MKT claimed the right to proceed into the Cherokee Nation because the land grant act had designated that the winning railroad should enter the Indian country through the valley of the Grand River, down which the Katy was building south of Parsons. The KN&V argued that it had fulfilled the conditions of the grant because Baxter Springs was situated on the banks of a tributary of the Grand River. A special board of commissioners favored giving the MKT permission to build through to Texas. The Secretary of the Interior agreed, as did the President, whose approval on July 20, 1870, gave the MKT the right to proceed across what later became Oklahoma. 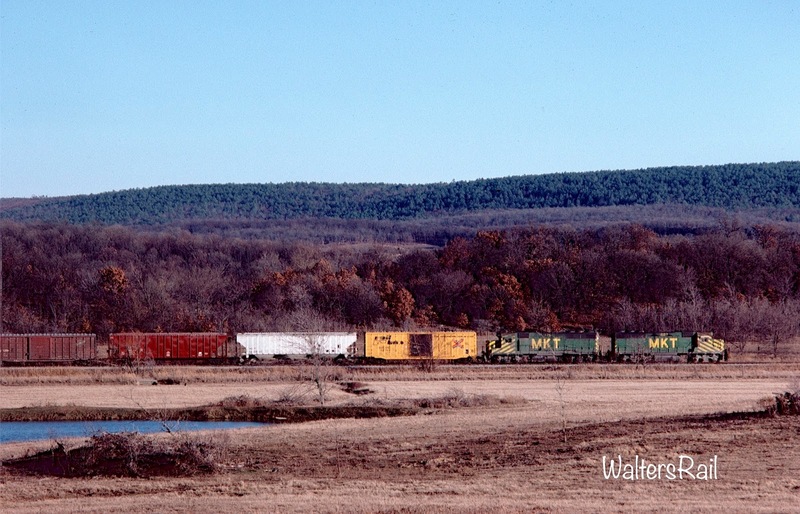 A southbound manifest rolls through Limestone Gap beneath Chockie Mountain, about 20 miles southwest of McAlester, Oklahoma -- January 1974. This scene no longer exists. A four-lane highway (U.S. 69) runs through the valley, while the mountain ridge, clear cut in the mid-twentieth century, is now covered with new growth timber. The Katy's original plan was to build to Fort Gibson, a military post established in 1824. The Cherokee Nation objected, so construction crews bypassed Fort Gibson in favor of Muskogee on the Arkansas River. 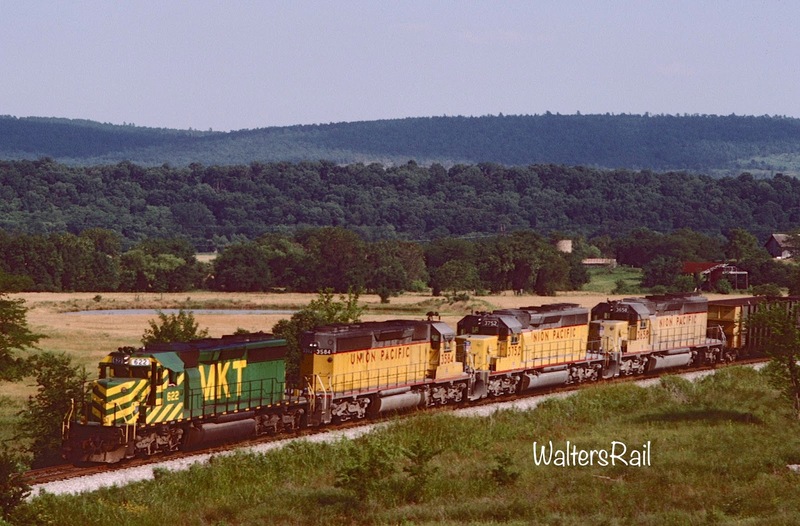 I have ridden on those railroads east of the Mississippi. They have little houses on wheels – whole strings of them. One string can carry several hundred people. These little houses can be shut up and the doors locked. If we allow the railroads to come, the white man will give a picnic some time by the side of the iron road and will invite all the fullbloods to attend. They will get the men to play ball off a piece. Then they will get our women to go into the little houses on wheels and will lock them up and run off with them into Texas or Missouri. Then what will we do for women? 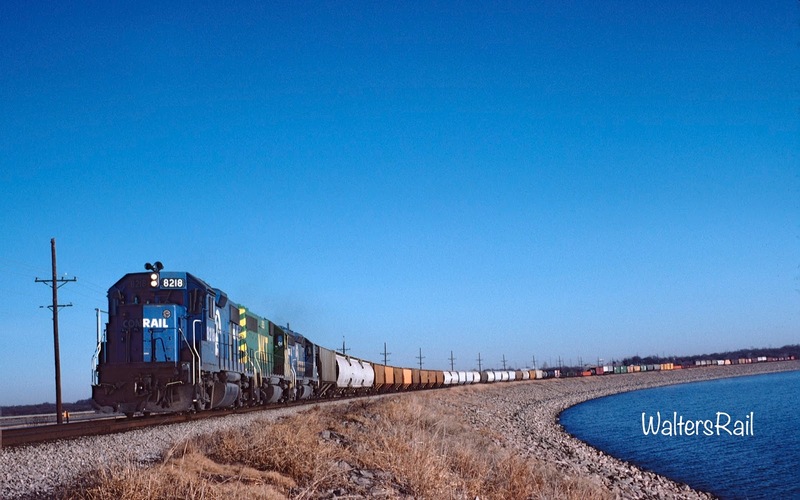 In the early 1980's, Conrail blue began appearing on the MKT -- units for which the Katy had been assigned the leases after Conrail refused to exercise its options to re-lease. 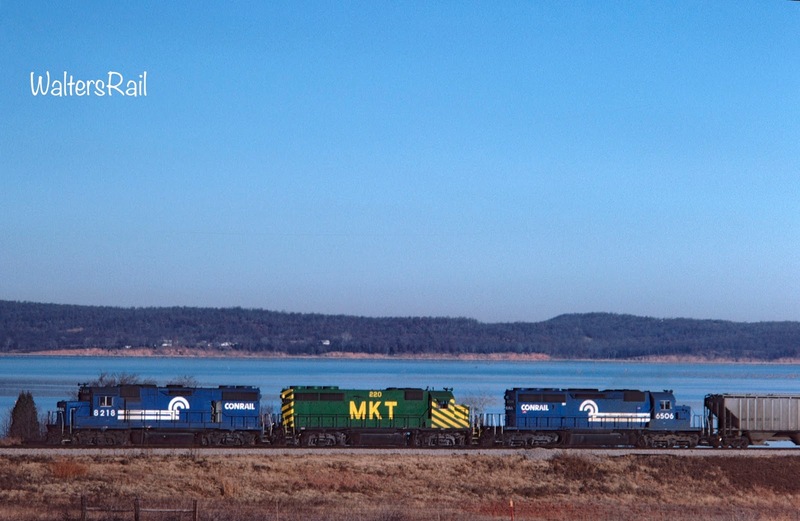 Most were eventually repainted, but for a time, Conrail power was common in southeastern Oklahoma. 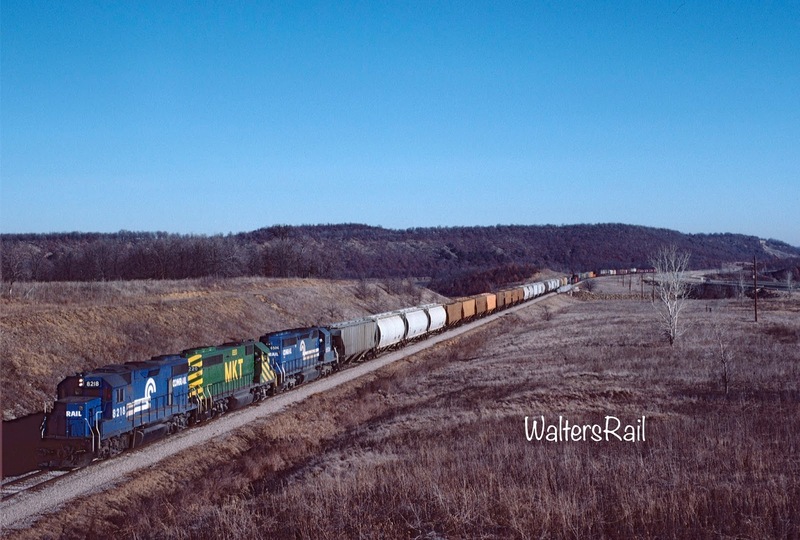 Here, two Conrail units and one John Deere lead a southbound grain train beside an abandoned portion of old U.S. 69, with an arm of Lake Eufaula just visible in the background. 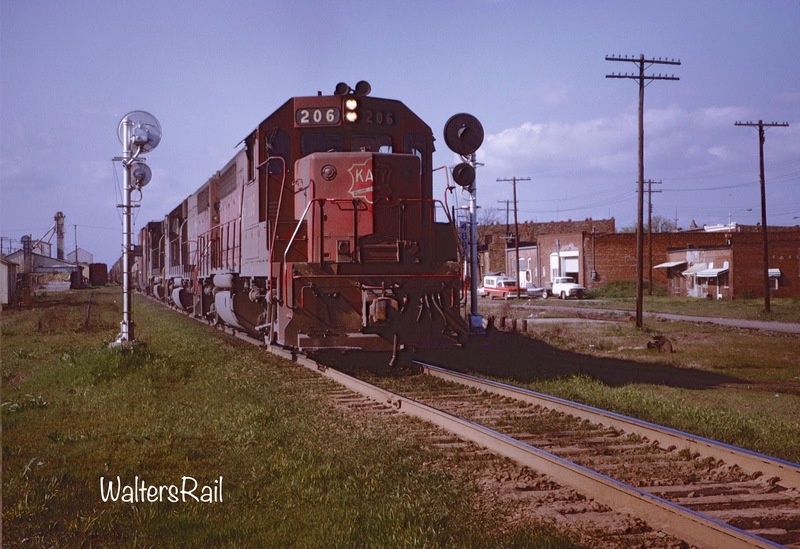 While Muskogee was the southern terminus of the railroad, operating conditions were horrible. Because this territory was not part of the United States, U.S. authorities had no jurisdiction. A group of outlaws called “terminuses” sprang up. 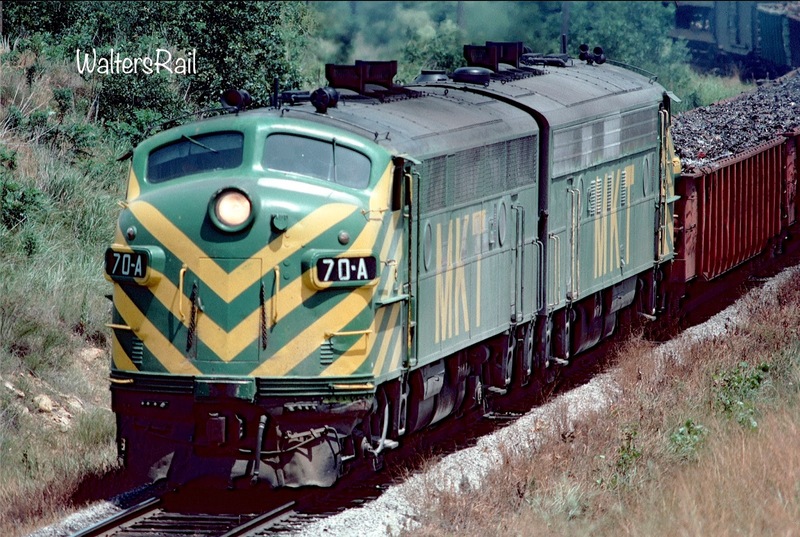 They got that name because they followed the railroad, stopping at each terminus as operations proceeded south. 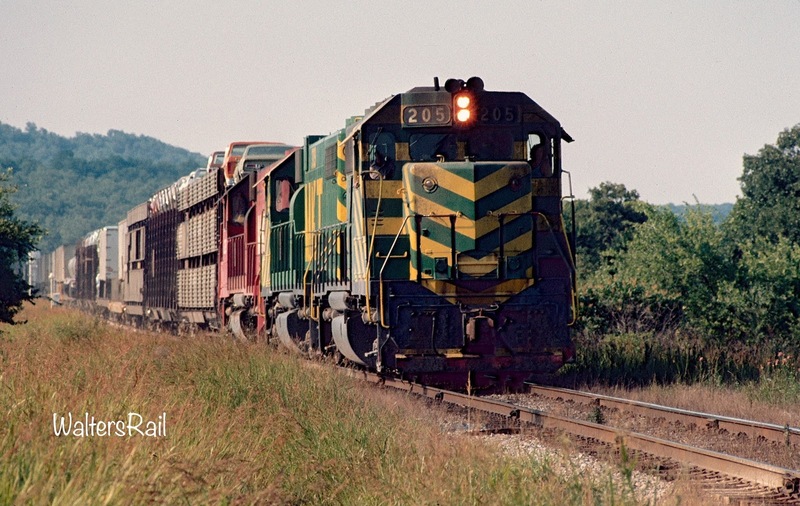 Train robberies were frequent in and around Muskogee, as were derailments caused by purposely misaligned switches. Conditions became so bad that President Grant ordered the United States Cavalry into the “Nations” – the colloquial name for the sovereign Indian territories – to guard federal property. The military eventually drove the outlaws into the mountains of the Choctaw Nation, now southeastern Oklahoma. 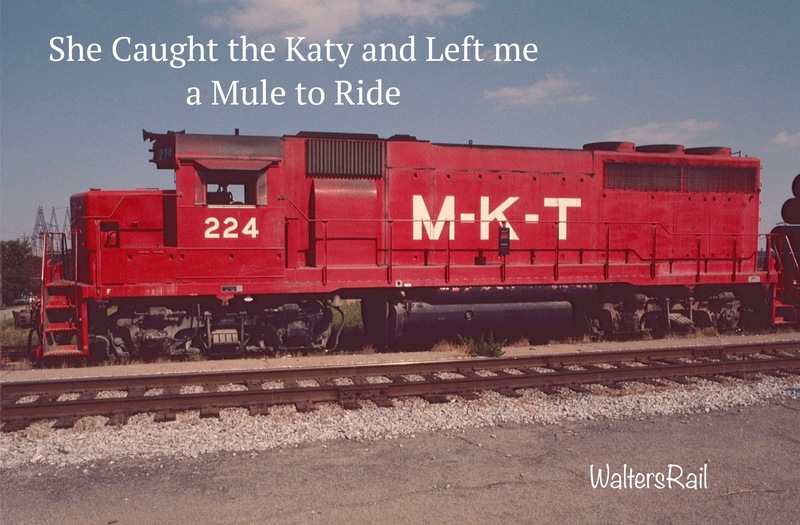 Eventually, the Katy mainline crossed the Red River into Texas. 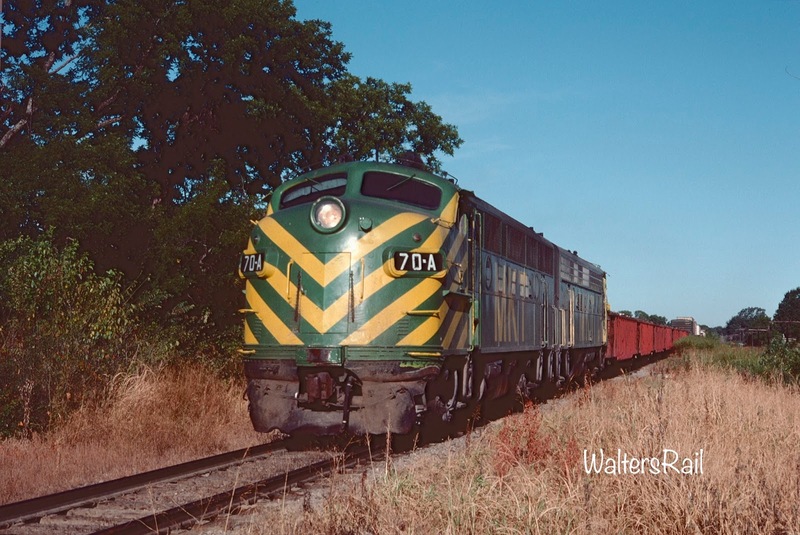 On Christmas Day 1872, the first regular train arrived in Denison. Eight years later financier Jay Gould acquired the MKT. 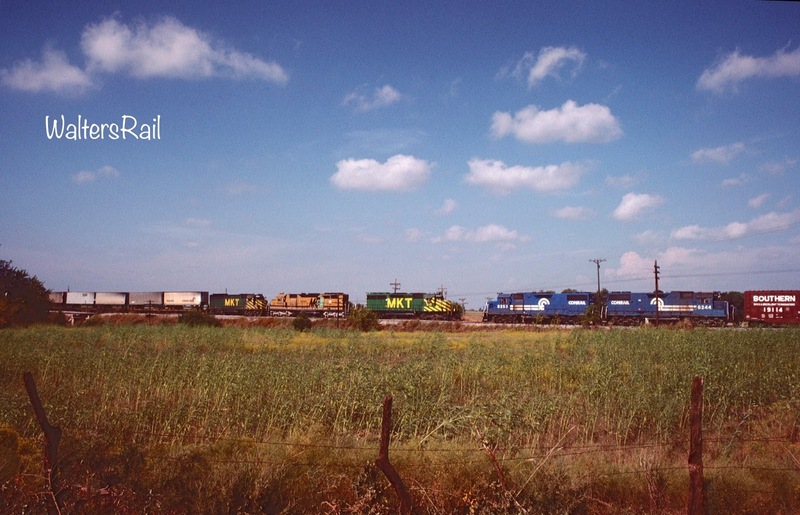 During the Gould era the railroad entered Dallas, Fort Worth and Waco and worked toward reaching San Antonio and Houston, which would all eventually see Katy service. 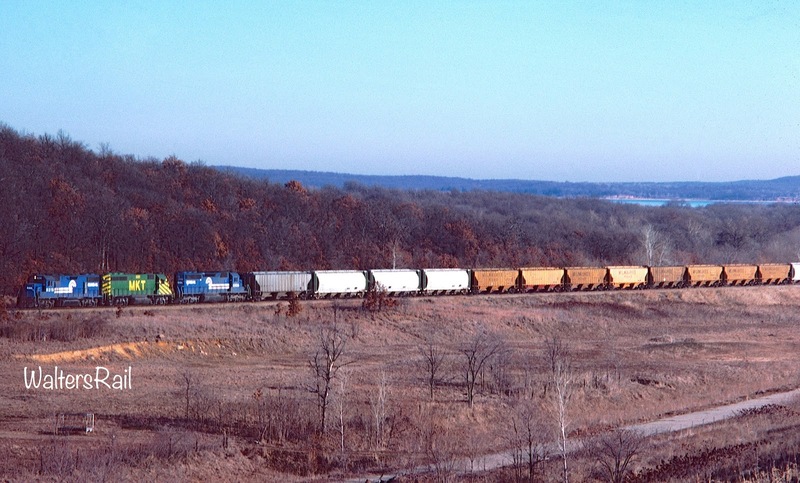 A southbound manifest labors into the grade, approaching Durant, Oklahoma. This section of the mainline was protected by Automatic Block Signals whose normal aspects were red until a train appeared in the block, when the signal would turn green. 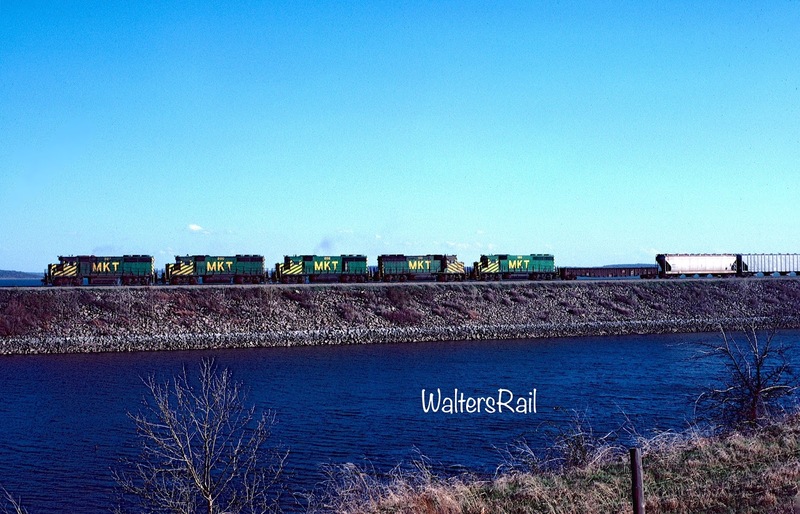 This image was taken in the winter of 1982, when I would be lucky to catch 2-3 trains in the daylight. Dispatchers operated by written train orders that crews would pick up "on the fly" from agents in Muskogee or McAlester. The agent would stand beside the track, holding up a long metal pole that split to a "Y" near the top. The written train orders were attached by a string between the "Y." A crewman would reach his arm out the open window of the lead locomotive and snag the orders between wrist and elbow. 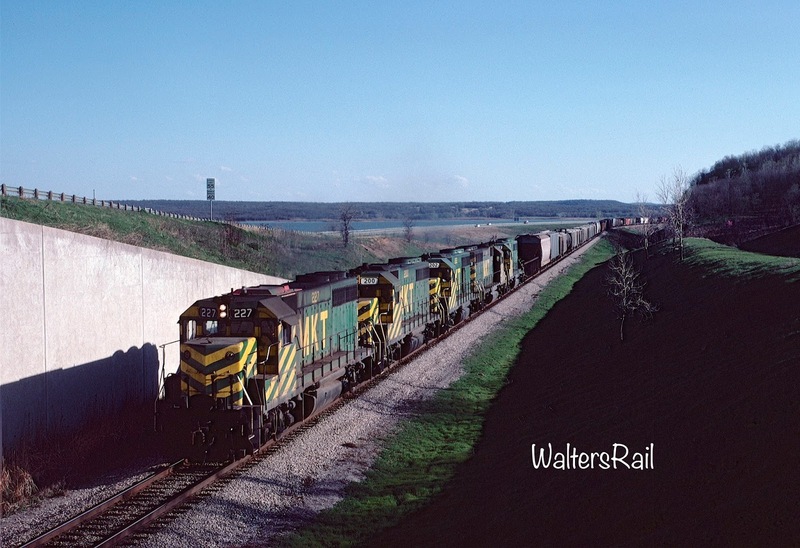 Trains would often wait in a siding for hours before a "meet" occurred. A station agent I chatted with once told me that low priority freight could take a month or longer to travel from Kansas City to Houston. 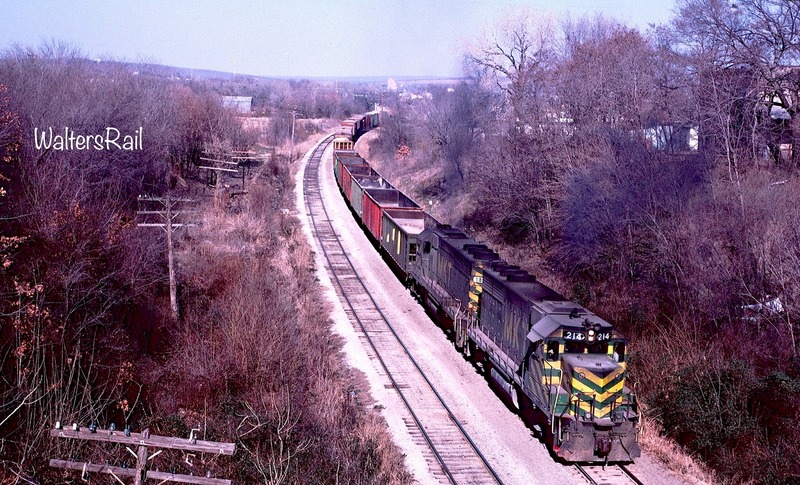 In 1900, the Katy obtained a line from Parsons to Kanas City by consolidating with the Kansas City and Pacific Railway Company, which had gained entrance to Kansas City by securing trackage rights over the Kansas City, Fort Scott and Gulf, later part of the St. Louis San Francisco Railroad (SLSF). 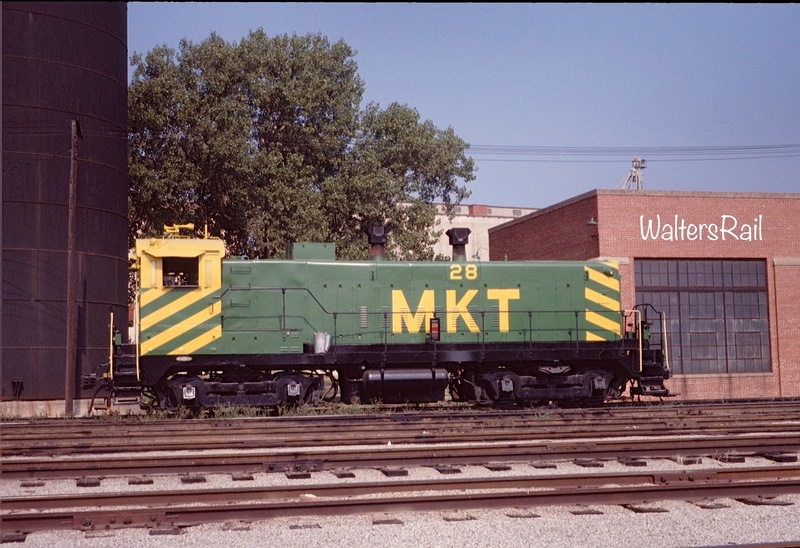 From 1900 until its acquisition by the UP in 1988, the Katy entered Kansas City over this trackage. 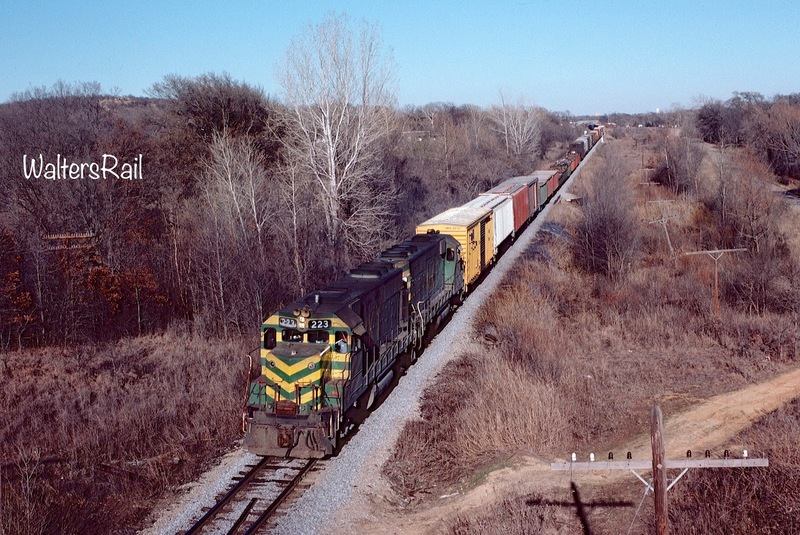 Once the Katy had acquired access to Kansas City, the line from Parsons to Junction City became a little-used branch. The railroad closed the depot in Emporia in 1952, the same year passenger service (in the form of a daily “doodlebug”) ended. 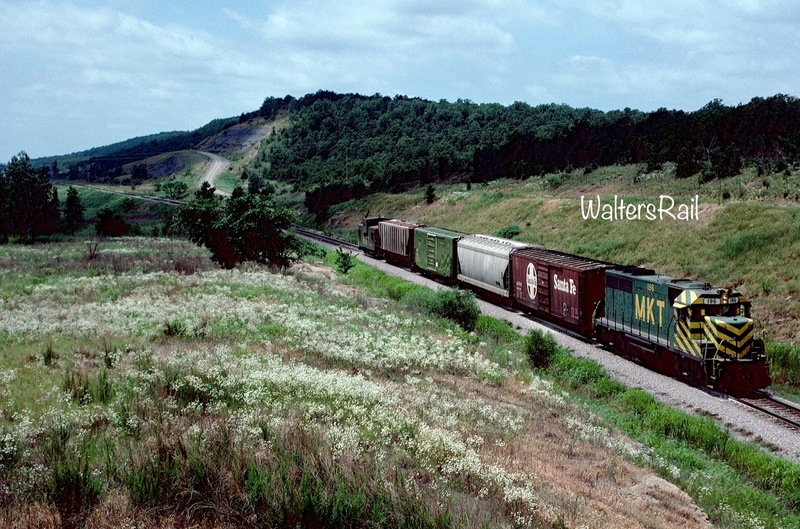 Freight service halted in 1957. Today, the only remnant of the original line of the Union Pacific – Southern Branch is a restored Katy depot in Council Grove, Kansas, occupied by an antique store. In the twentieth century, the Katy mainline through Oklahoma was disrupted by two major Army Corps of Engineers construction projects: The McClelland-Kerr Arkansas River Navigation System and Lake Eufaula. The McClelland-Kerr project created a navigable waterway from the Mississippi River to Catoosa, Oklahoma, near Tulsa – fulfilling Will Rodgers’ prediction that “pork barrel” legislators would someday turn his hometown into a seaport. Both McClelland (Arkansas) and Kerr (Oklahoma) were U.S. Senators, and although Catoosa was not Will Rogers’ hometown of Oolagah, it was close enough. The project required the relocation of the bridges across the Verdigris River used by Katy’s Texas mainline and Missouri Pacific’s line to Texas (the former Kansas, Oklahoma and Gulf). A new structure, called the Okay Bridge, was built to handle the traffic of both railroads. 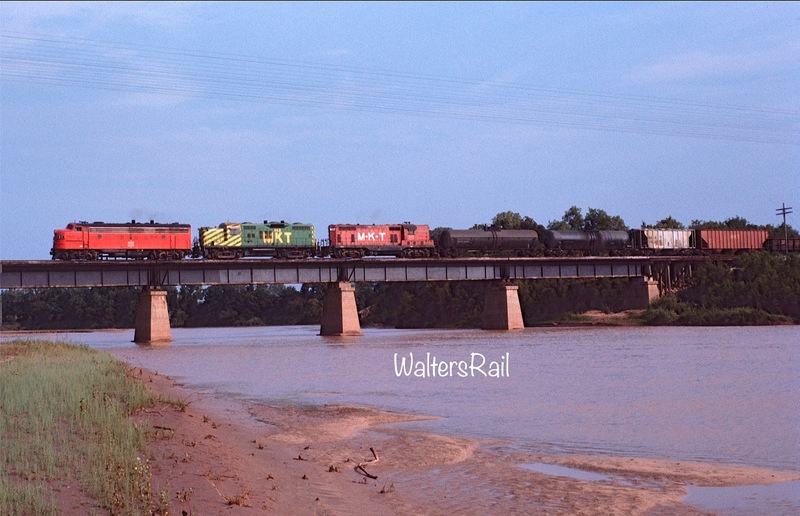 A southbound manifest crosses the Verdigris River at Okay Bridge. 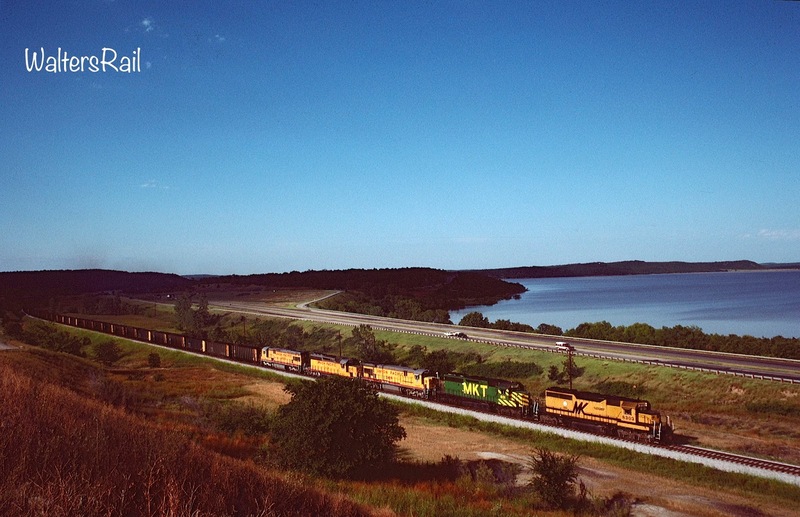 The tiny town of Okay, Oklahoma, sits just beyond the freight. There is no easy way to photograph the bridge or even to get near it. From either side of the river, one must hike a significant distance to find a profile shot like the image above. I absolutely, positively do not recommend attempting to drive to the bridge. The only "road" is filled with water in the spring and fall. In winter and summer, the "road" generally dries to reveal pot holes as deep as three feet. A Jeep Wrangler with a six inches lift kit might be able to make it -- with the emphasis on "might." I don't have the extra six inches on my Wrangler and so the only time I tried it I got stuck. Someone had to drive in a John Deere tractor to pull me out, and the tractor just barely made it. 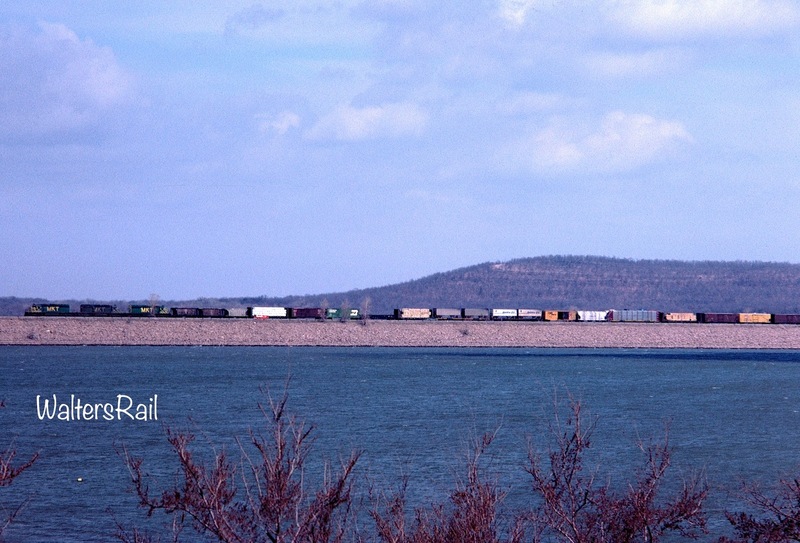 A northbound manifest prepares to duck under U.S. 69 south of Eufaula, Oklahoma, with an arm of Lake Eufaula in the background. When the lake was constructed, both the highway and the railroad were rerouted. Damming the Deep Fork, North Canadian and South Canadian Rivers formed Lake Eufaula, a monstrous lake winding and curving through the hill country of east central Oklahoma, with a shoreline hundreds of miles long. Like all nineteenth century rail construction, the Katy had followed river valleys. Inundation required relocating the line through the hills above the flood plains. 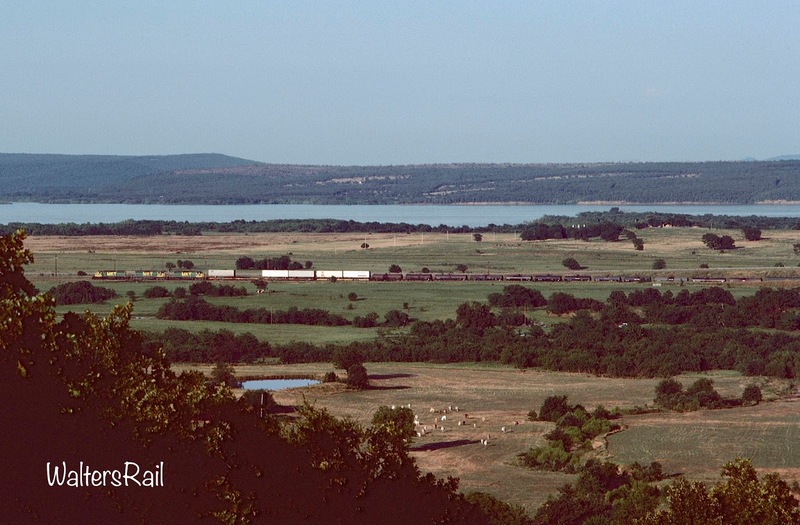 Some of the mountains of southeastern Oklahoma run to the edge of Lake Eufaula. Although the Katy does not cross those ridges, it runs close enough to create some unique photographic opportunities. 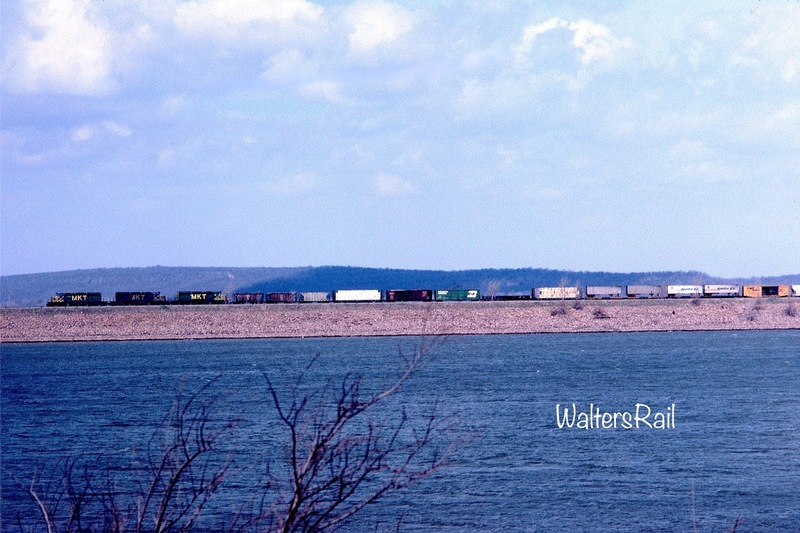 A northbound mixed freight runs beside an arm of Lake Eufaula in July 1985. Created by the damming of three rivers that came together within a few miles of each other, the lake contains many arms that curve through the river and creek valleys. The terrain is exceptionally rugged, and in the 1970's and 1980's, because the highway and railroad had been relocated, many open shots existed where foliage had been cleared. Alas, most of those shots have disappeared in the 21st century, including the image above, as trees have reclaimed their natural place in the landscape. This image gives an excellent view of the relocated highway and railroad. Both the original highway and railroad ran about a half-mile to the west and are now under water. 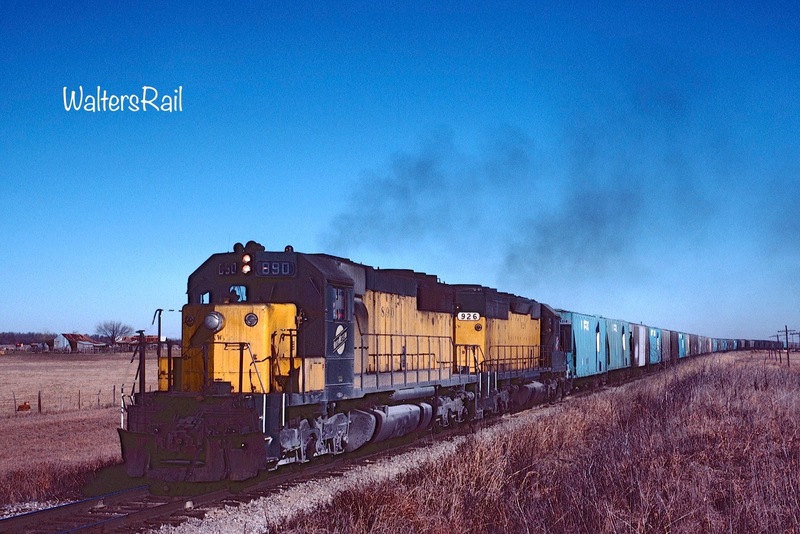 My favorite Katy line ran from Parsons, Kansas, to Oklahoma City, originally constructed by the Missouri, Kansas and Oklahoma Railroad Company and later acquired by the Katy in the early twentieth century. In northeastern Oklahoma, the line bisected the Osage Hills, the same geologic formation that in Kansas is called the Flint Hills. That portion of Oklahoma is remote, isolated and mostly unpopulated. Near Cushing, Oklahoma, the line crossed the Cimarron River on a unique bridge that supported two different sets of rails. A Santa Fe branch line also used the bridge. The inside rails of each line crossed at both approaches to the bridge, and then the two sets of tracks ran parallel to each other across the river, the inside rail of each track a couple of inches apart from the outside rail of the other track. Thus, the bridge did not have to be wide enough for two tracks, and no switch was required for trains to cross. Semaphore signals guarded the approaches on each side. 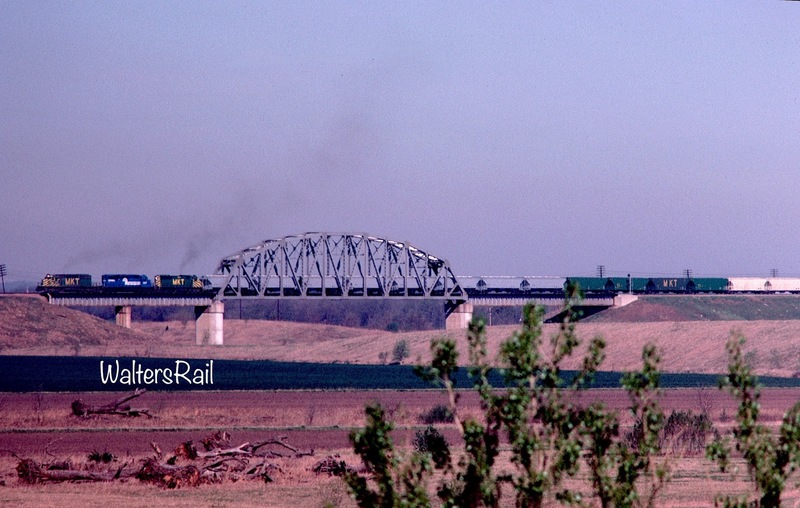 A southbound train to Oklahoma City crosses the Cimarron River just north of Cushing, Oklahoma, in September 1973. About one month after this image was taken, heavy rains washed out both approaches to the bridge, and the Katy thereafter never ran another train across the mighty Cimarron. Occasionally, foreign power would appear on the Katy. 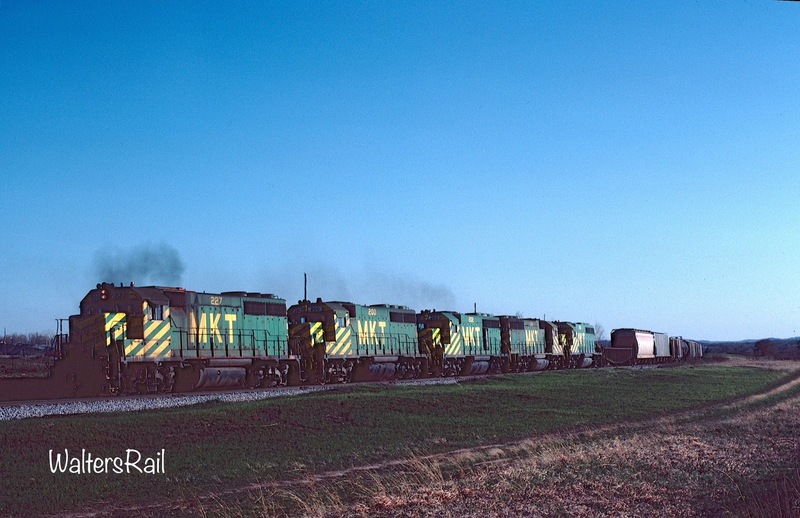 Here, Chicago and Northwestern locomotives pull a southbound grain train toward Atoka, Oklahoma. Atoka is primarily known for the name of its high school sports teams: the Wampus Cats. 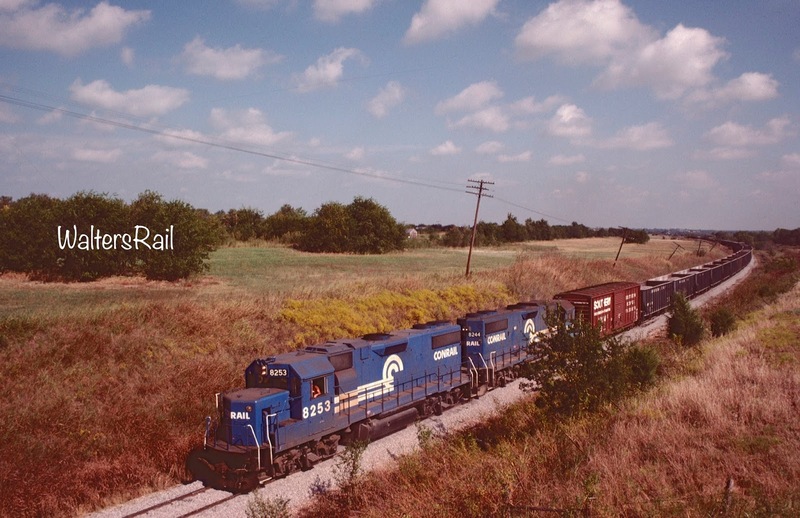 Past Cushing, the line entered the Cross Timbers, an oak forest running north/south through central Oklahoma. The line crossed several valleys on large “fills.” Over the years, trees began growing on each side of the embankments. Eventually, the trees grew tall enough to arch over the tracks and touch each other, forming “tree tunnels.” There was no reason to trim the trees, because trains were limited to 15 MPH. The tunnels were so thick that sometimes you would not even know that a train was running unless you could hear it above the wind. 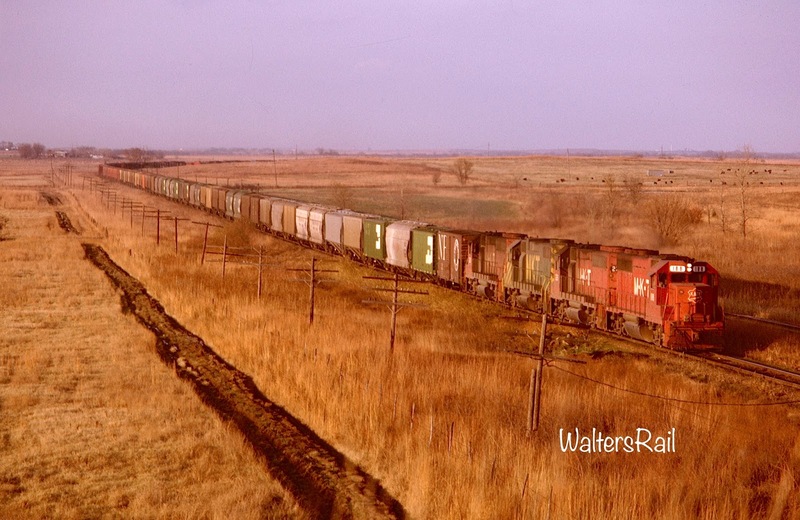 By 1973, the Oklahoma City line was in horrible condition. That fall, rains were especially heavy, and parts of the approaches to the Cimarron River bridge washed out. The ICC proposed that the Katy rebuild the approaches -- for one train per day, six days per week! 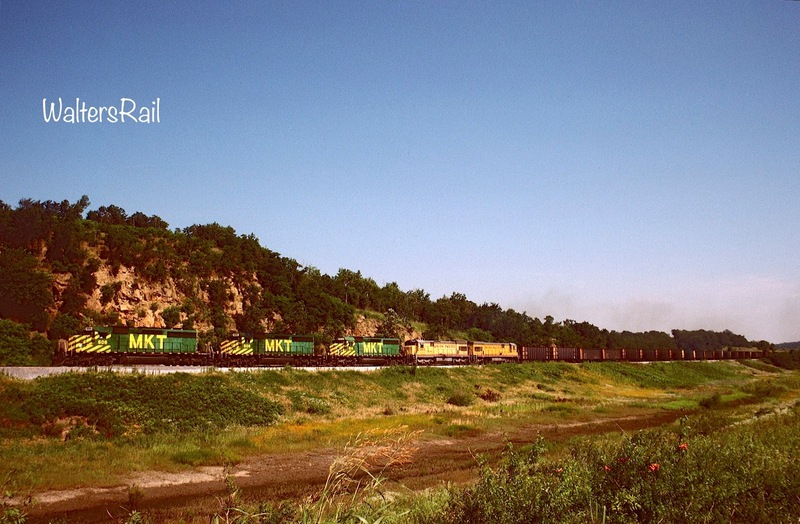 The Katy had different ideas, embargoed the line and began running trains between Oklahoma City and Parsons via McAlester, Oklahoma, after obtaining trackage rights over the Rock Island Railroad (part of the old Choctaw, Oklahoma and Gulf) between Oklahoma City and McAlester – where the trains would transfer back to the Katy north-south mainline for the trip north to Parsons. This almost doubled the mileage but saved the Katy from the cost of rebuilding the approaches. 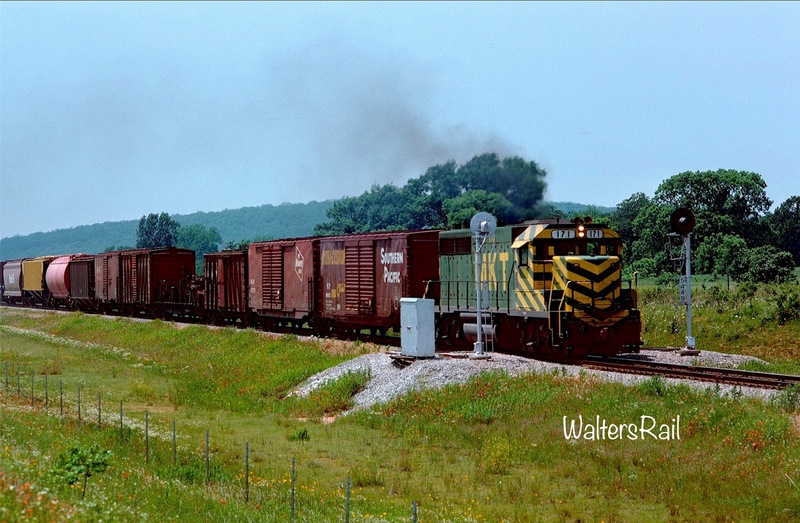 Finding a Katy train on Rock Island tracks in the daylight was difficult, but I managed to photograph a few. 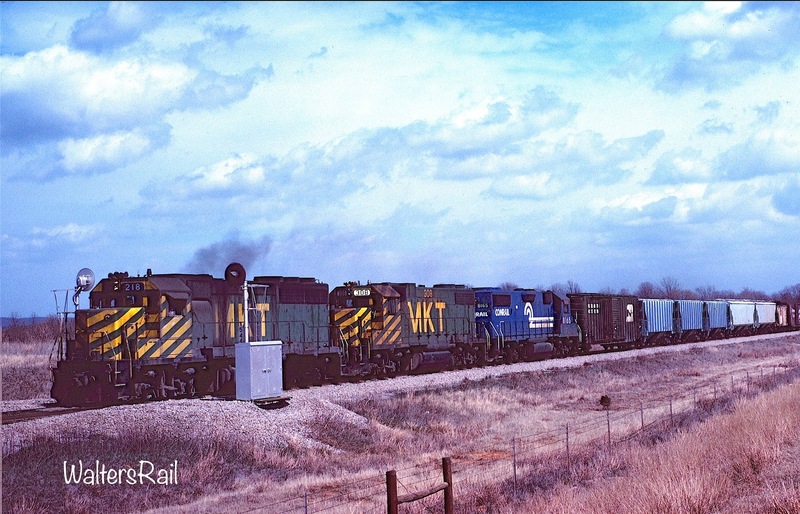 Other than scrap metal, the trains carried little traffic, and the Katy eventually abandoned service completely. 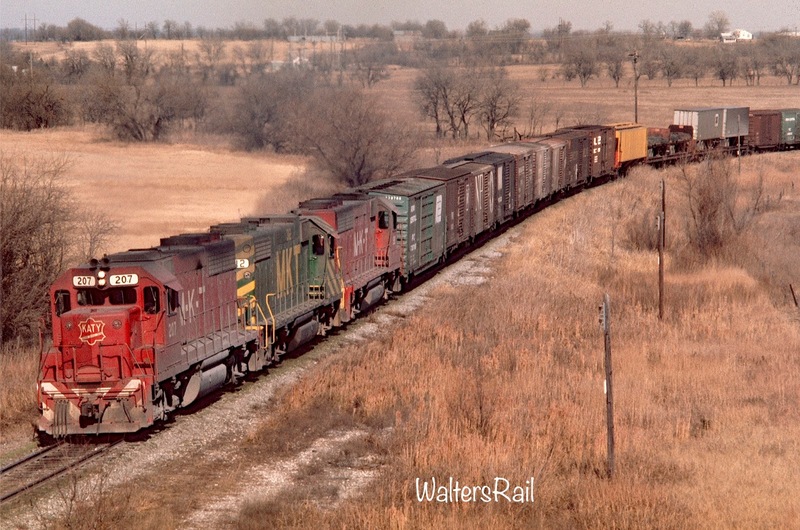 MKT 78-C South (compass west) leads a short train of relatively high-priority freight along Rock Island tracks at Shawnee, Oklahoma, in October 1978. 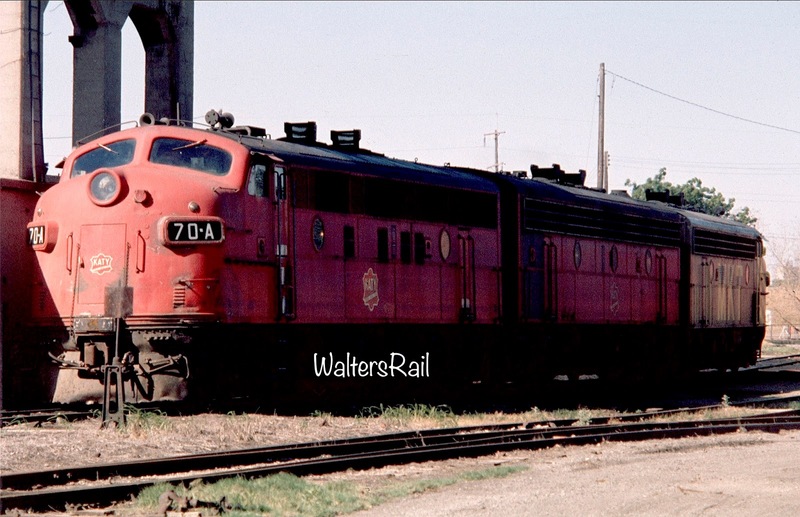 This pair of repainted F-Units made the run from Oklahoma City to Parsons and back for about two years before the service was discontinued. I do not know why the crewman was hanging out of the door, unless he was looking for holes in the tracks. These trains never rain more than about 30 MPH. 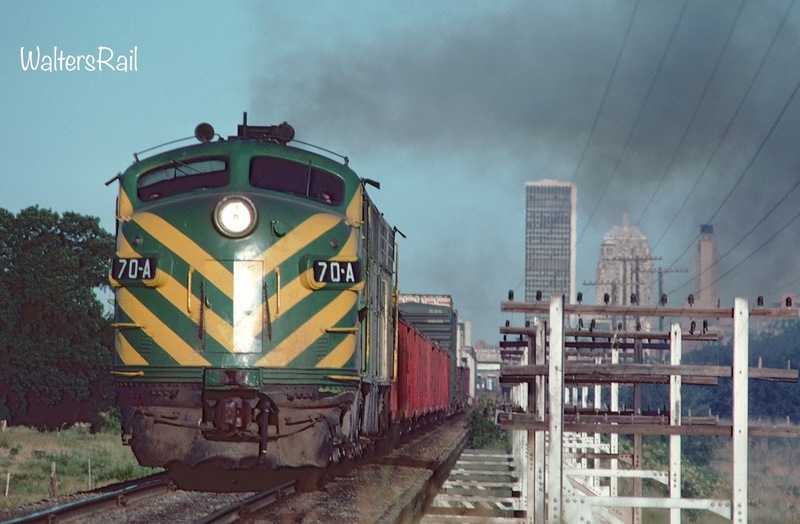 Above is the same pair of units, in reverse order, leading an northbound (compass east) train out of Oklahoma City, bound for Parsons, in July 1978. Thirty-one years old F3A 70-A is leading the charge, wearing a bright coat of paint that belies its age. 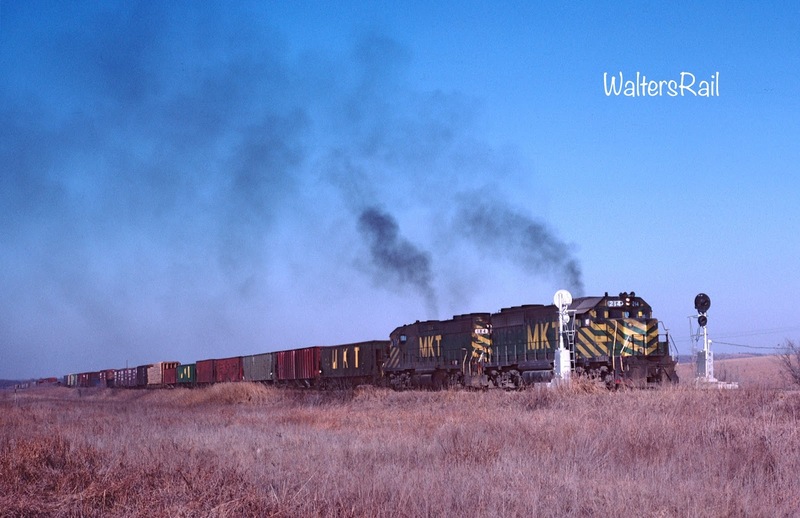 The photographer chased this train from Oklahoma City to McAlester. I was never alive to see the Katy in action, but she's still my favorite railroad! Thanks for sharing all the great history and photos! 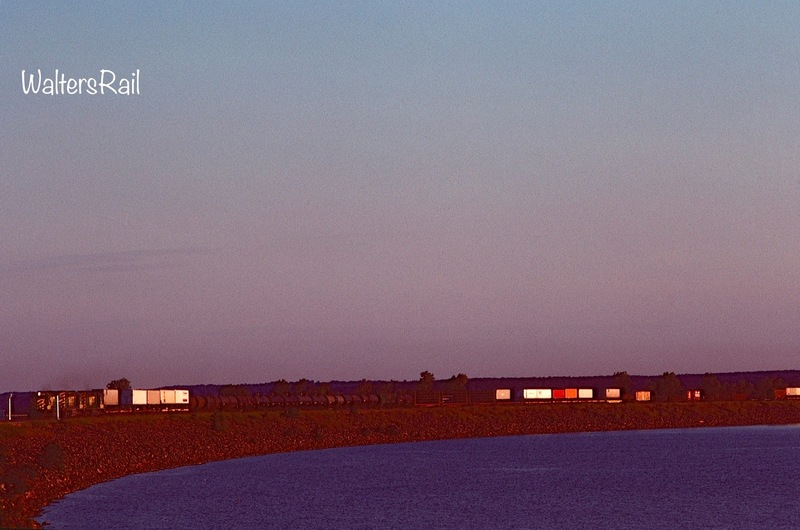 I particularly love the photos of the Oklahoma City line; as an OKC native, they're neat to see. 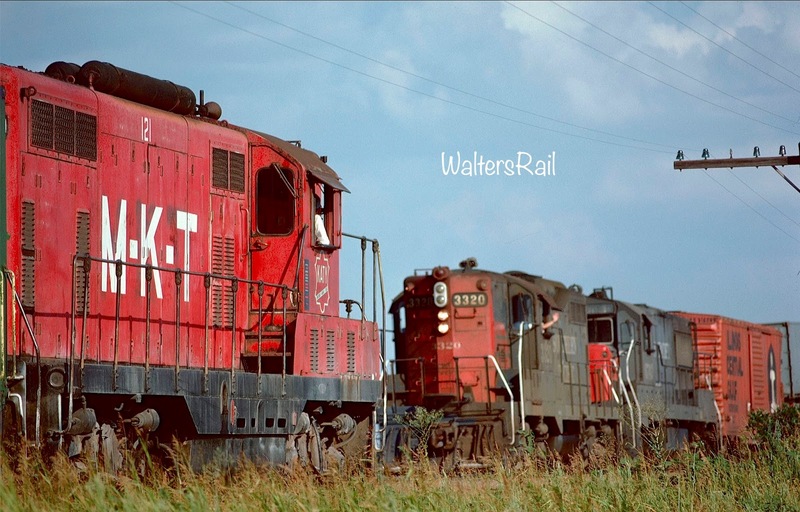 Did you ever take any pictures of the OKT operation once the Katy took over many of the old Rock Island lines in the state?